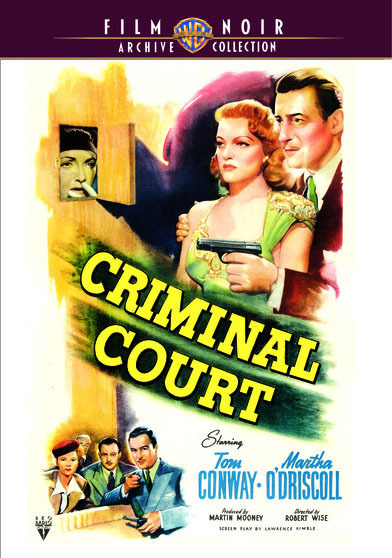 CRIMINAL COURT (1946) is an enjoyable RKO "B" film just released in the Warner Archive's Film Noir Collection. 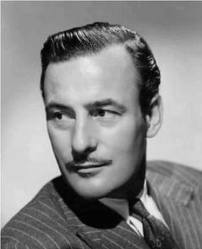 CRIMINAL COURT stars "B" film stalwarts Tom Conway and Martha O'Driscoll. Conway, taking a break from starring in RKO's Falcon series, plays star defense attorney Steve Barnes. Barnes is planning to run for district attorney, but his entire life goes off track when his girlfriend, nightclub singer Georgia Gale (O'Driscoll), is accused of murdering a mobster (Robert Armstrong). No one believes Georgia's alibi when Steve claims Georgia couldn't have shot the man -- because he himself was there when the man was accidentally shot! Georgia is tried for murder. Only one person can save her, Steve's secretary Joan (June Clayworth), who secretly saw the whole incident go down but who fears for her life if she testifies. I first saw this film in 2012; I enjoyed it then and felt the same way on my second viewing. It's a short and sweet film, running just a bit over an hour; the lead actors are appealing, and I especially enjoyed the musical sequences. O'Driscoll sings the McHugh-Adamson standards "A Lovely Way to Spend an Evening" and "I Couldn't Sleep a Wink Last Night," songs which had also appeared in RKO's HIGHER AND HIGHER (1943) three years previously. O'Driscoll is someone who has increasingly grown on me as I see more of her work; she was charming in Paramount's PACIFIC BLACKOUT (1941), and she also made an impression as Whitney, the nightclub singer in RKO's THE FALLEN SPARROW (1943). The latter film is also available from the Warner Archive. I wish O'Driscoll had made more films, but she was in just one more movie before retiring for a long and happy marriage to businessman Arthur Appleton of Appleton Electric Co. The Appletons had four children, and among other endeavors they built the Appleton Museum of Art and bred thoroughbred race horses at Bridlewood Farm, both in Ocala, Florida. O'Driscoll passed on in 1998 and is buried in Chicago. CRIMINAL COURT was an early credit in the directing career of future Oscar winner Robert Wise, who started out as an RKO editor with credits including CITIZEN KANE (1941) before he moved into directing. Wise worked his way up through the "B" ranks; his next film after CRIMINAL COURT was the film noir classic BORN TO KILL (1947), starring Lawrence Tierney and Claire Trevor. CRIMINAL COURT was shot in black and white by Frank Redman. The screenplay was by Lawrence Kimble, based on a story by Earl Felton. The print of this Warner Archive DVD is occasionally splotchy, such as in the early scene where Georgia sings "I Couldn't Sleep a Wink Last Night." For the most part the print quality is good, and given the entertainment value of this relatively obscure film, it's marvelous that it's now so easily available. There are no extras.